Northstar pressure washers are amongst the top industrial and heavy duty pressure washers on the market today. They are in the same league as Simpson pressure washers and are suitable for commercial and industrial use. They have been in production for over ten years and typically run on Honda engines. In terms of pumps they combine Honda engines with robust top of the range brand pumps such as CAT and Comet. Perhaps what is most outstanding about Northstar washers is the fact that they are easily serviceable and have very good warranties compared to other brands in the industry. Some pressure washer pumps found on other brands cannot be serviceable. This means once the pump is faulty it will need complete replacement. We highly regard Northstar pumps for the simple reason that they are serviceable. It is possible for you to replace seals or damaged pump parts without necessarily having to replace the entire pump. Pressure washer pressure measured in PSI (pressure per square inch) and the amount of water release per minute measured in GPM (gallons per second) are the key considerations when talking about the power and effectiveness of any pressure washer. This is considered in the context of the washer machine's horse power (HP). The higher the PSI and the GPM the more powerful the washer is and the less time it will take to complete a job all things being equal. The Northstar pressure washer typically has adjustable pressure empowering you to adjust your pressure for specific results. This is however not available for the model 1577543. This gives the Northstar pressure washer ability to turn easily from one to another of various task. This is water an industrialist and commercial user renting the machine out really needs. Another feature of note in any pressure washer by Northstar save for the model 1577543 is the sight glass which enables the user to quickly check pump oil level. Nugget: Horizontal shaft engines last a staggering five times longer than vertical shaft engines. This gives Northstar washers serious leverage over other brands. When working in a heavy environment it is useful to have a rear entry connection of the hose to the gun. This helps keep the hose clear of your way. Northstar pressure machines with a PSI of 2000 and higher are designed to have rear entry connection of the hose to the gun. This might seem like a small thing but it does make all the difference when it comes to efficiency. Designed for home use this 2800psi Northstar washer is in the league of other home pressure washers such as faip pressure washerand even some steam cleaners. Selling for about $400.00 on internet stores this is an economical choice amongst all available Northstar washers designed for home use. The washer as a flow of 2.5GPM and uses an axial pump. The pressure washer runs on gasoline and comes with a single 25in. nozzle. It has a Honda GC horizontal shaft engine with a gross torque of 6.9. Customers who have purchased this home washer appreciate its effectiveness and efficiency around the home. It has all the power one needs for home use. Some users note that this washer will reduce in half the time it takes to clean the garage and drive way. The Honda engine on this machine makes all the difference. Some users have even successfully attempted to use this pressure washer for commercial purposes. This however appears to wear out the pump overtime sooner than it should when using a commercial heavy duty one. The pump will require replacement. We give this pressure washer a four out of five stars rating fo home use. The washer is not suitable for heavy industrial use even though the price might be attractive. Go for something that will last you longer and designed for the purpose. Selling for about $800.00 each on places such as Amazon this 3000psi Northstar washer produces 2.5GPM of cold water at full throttle. It runs on CAT direct drive triplex pump (CAT 3DX). It is suitable for a rental business and professional industrial use. This machine is shown to be favored by over 80 percent of self-service car wash businesses. Car washing is demanding power wise and the washer appears to match that demand. 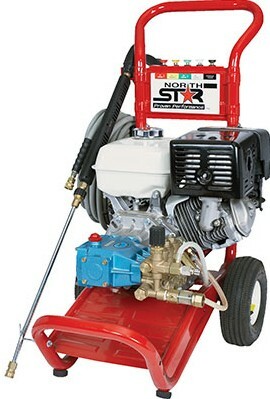 This pressure washer runs on a gasoline (petrol) Honda GX160 OHV engine with a gross toque of 7.6. The engine has a low oil shutdown to prevent engine damage. It is also favored by many users because of its horizontal shaft engines which have been shown to last up to five times longer than vertical shaft engines. The pressure washer has an adjustable pressure for job versatility. It has a downstream chemical injector and is affixed on a push down-style cart for smooth and balanced movement. 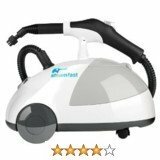 This Northstar pressure washer is supplied with five types of nozzles namely 0, 15, 25 and 40 degree nozzles as well as a chemical nozzle. It has a 24 months parts or 24 months labor warranty. You may also sign-up for an extended warranty repair plan at an additional cost. 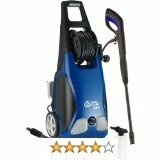 Here at Pressure Washer - Steam Cleaner Reviews we highly recommend this product with confidence. Most people that have purchased this washer have found it met their expectations. It's been used to perfectly do driveways, porches, customer houses with much satisfaction. Customers also report enjoying the changeable nozzles that empower them for the job. We give this washer five out of five stars. If it's for you may read more about how to purchase . Northstar pressure washer partsare readily available. In fact Northstar prefers to manufacture its pumps highly servicable meaning you can order replacement parts to service the entire washer including pressure guns, hose etc. Follow link to learn more about pressure washer parts for Northstar and where to buy them. 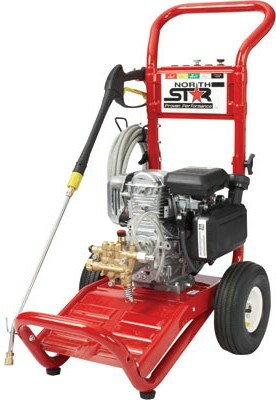 This Northstar pressure washer sells for just under $1200.00 online . It produces a lot of power at 4000psi and 3.5GPM. It is Northstar's most powerful pressure washer it the current range and is the only pressure washer recommended by Northstar for painting stripping and graffiti removal with guaranteed results. Lower psi washers may be used but may not produce the desired results. The pressure washer is powered by a more powerful Honda engine namely the Honda GX390 OHV engine which comes with a cast iron sleeve and low oil shutdown function. 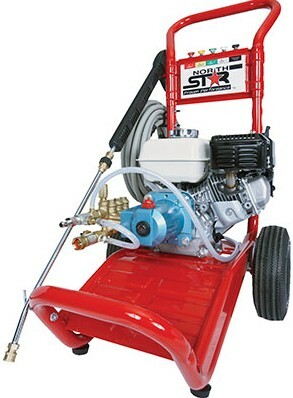 As is custom with Northstar pressure washers the machine has a horizontal shaft engine which is more durable and long lasting compared to the vertical shaft engines. Compared to the 3000 psi washer which has an engine gross torque of 7.6 this washer has a torque of 18.5 with a direct drive CAT 66DX pump and an industrial rear entry gun. This professional 4000 psi Northstar washer has a gasoline fuel capacity of 1.6 gallons making it work longer. However,if you are looking to receive it with a hose reel and mount these are unfortunately sold separately. Some users wish these would be supplied together with the washer. Professional reviewers of this unit give it very high marks and ratings. Some even use it for home use. As usual advice from renowned users of these washers is that they must be stored correctly during freezing seasons. I have used it for three years with no problems. Price is relative. Very satisfied.